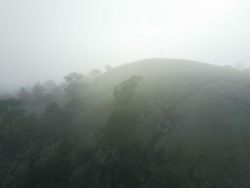 I left Elmore in fog which continued for the first hour of the journey. 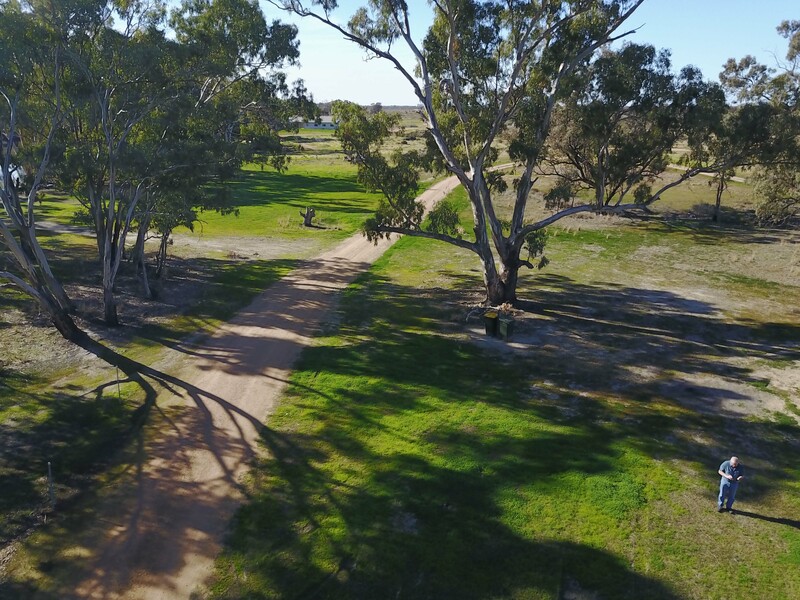 I visited Terrick Terrick National Park hoping to get a good photo from the drone. It was still foggy which was disappointing, but I took a photo anyway. 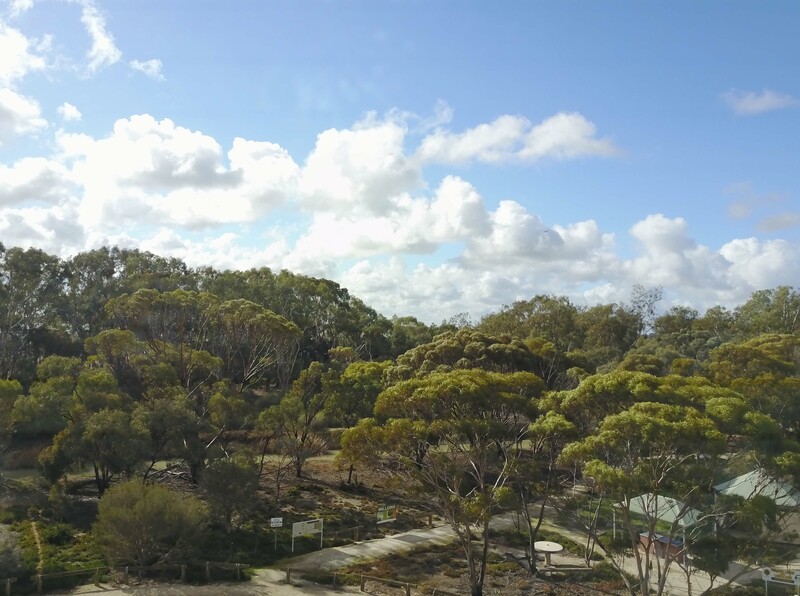 By the time I got to Burke and Wills Camp 13 it was sunny so I decided to have a picnic lunch in the delightful picnic area. I got tricked by the BBQ, checked that the light came on, back to the car for all the picnic stuff, thinking of a hot sausage in bread. Back to the BBQ, stone cold! Anyway the salami sandwich was really good. Got the drone out and took a couple of photos one shows the lake. Camp 13 was on the far side. The other photo is of the picnic area. 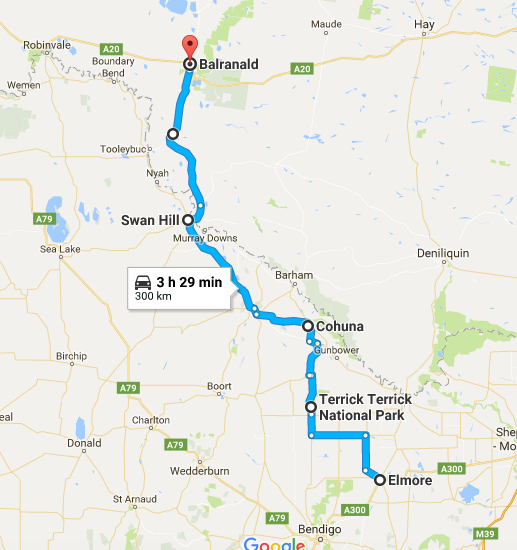 After lunch off to Balranald via swan Hill. 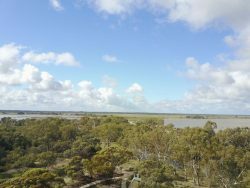 It was interesting at the Wakool river to see that Camp 13 was not flooded and the river now looks like the standard inland river, deep banks and not much water. 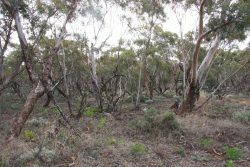 Along the way I took a photo of the Mallee scrub that Burke and Wills had to traverse, imagine taking 20 men plus lots of horses, camels and 6 wagons through this. Set up at the delightful caravan park at Balranald ready to visit Yanga National Park tomorrow. At Yanga it was out with the drone and increase the max height to 50 metres, at which, to me, it looks like a fly. Took photos of the woolshed and the woolshed picnic area. 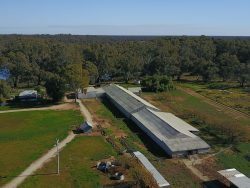 The woolshed looks far more imposing from the air. 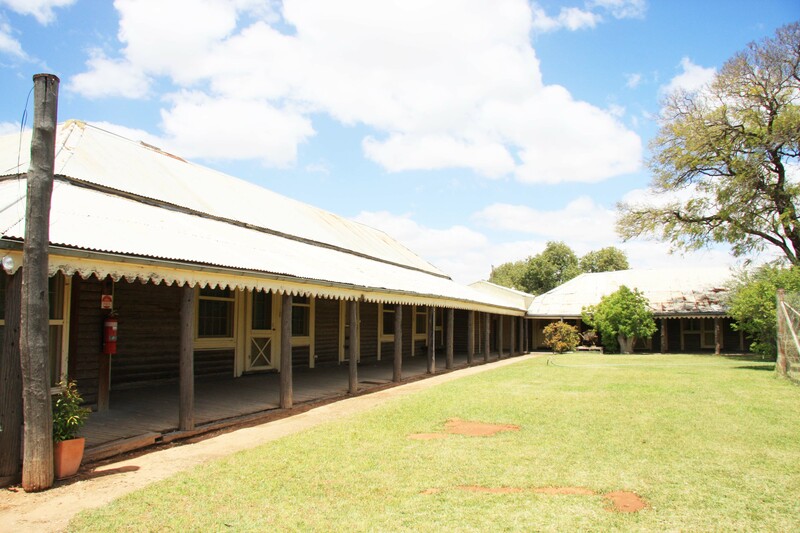 I then went to Mamanga Campground a couple of K’s further on. 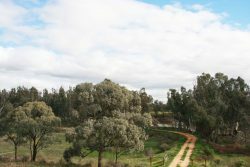 It is on the murrumbidgee River and an attractive spot. 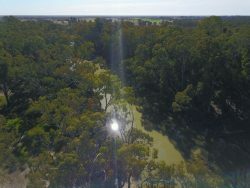 It got a bit exciting as I had the drone at max height away from me over the river and it sounded an obstacle alarm and I couldn’t see it! Had to resort to the automatic “return home” and it was a relief to see it appear over the trees and then it landed exactly where it had taken off. You have to set the “return home” spot before you take off (the drone sets it but I like to make sure). At Reedy Lake I had forgotten to take off the gimbal clamp and had to land it. When I hit “return home” after taking photos it headed off the wrong way as the drone had reset the home spot automatically. Fortunately I was able to take over control and bring it back to me. You can see the Murrumbidgee River in the photo which is right next to the campground. Yanga is a new park formed around Yanga Sheep Station in 2005. It is interesting and worth a visit. 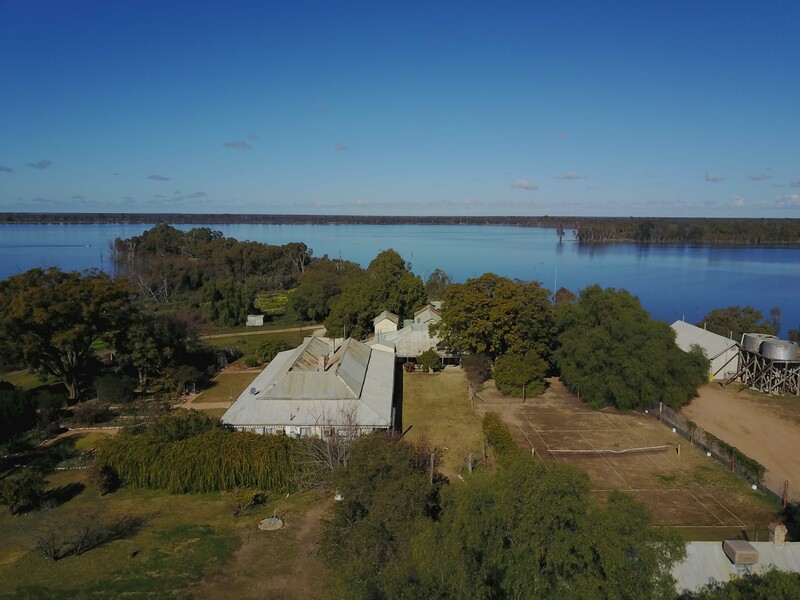 I also visited the homestead and took a photo of the homestead from the drone which also shows Yanga Lake that surrounds the homestead on three sides. 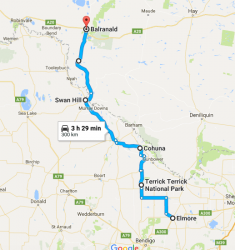 On Wednesday I will head off to Mungo National Park for a couple of days and will probably have no mobile coverage so it may be a few days before another post. 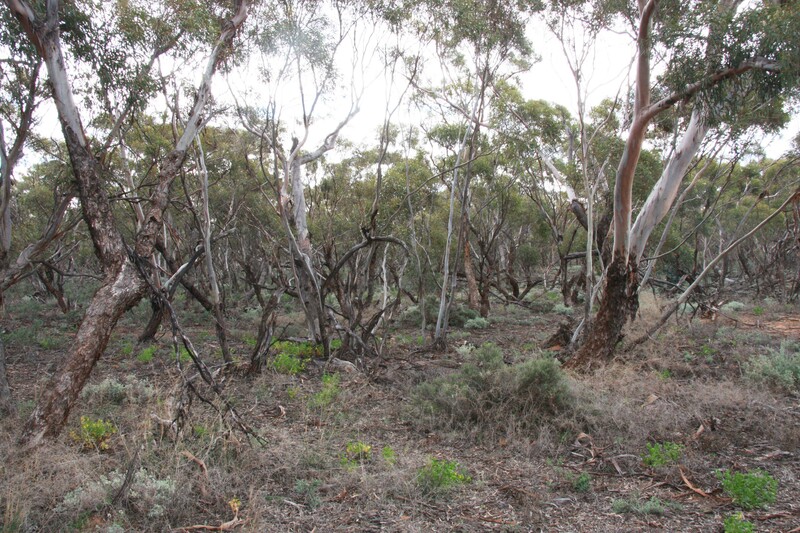 That Mallee scrub must have sapped their will. Using horses was folly later on.